Overall I am happy with our home. It is not perfect and there are still some things about it that I want to change. But for the most part, I am happy with it. The bathrooms on the other hand are a whole other story. I hate the bathrooms in this house. Whoever had the idea to put carpet in the bathroom should be shot. So for fun and self torture I tend to browse sites and look for ideas on how to update our bathroom. Besides tearing the carpet out and burning it, of course. I really like the look of a Modern Bathroom. Unfortunately a complete bathroom overhaul is not in the cards anytime soon. 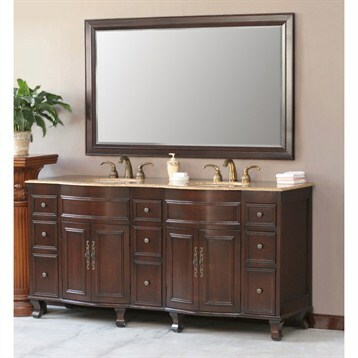 You can find me browsing the bathroom vanities and dreaming that my bathroom is not ugly!